Local authorities also refused to give protection to Muslims who wanted to return to their original places of residence, Burma Human Rights Network understands. “This is extremely disappointing to see that these families were denied to return to their own property for being Muslim whereas Buddhists from Bangladesh have been allowed to relocate to Burma with the support of authorities and have been provided with full facilities. It is appalling that the fate of Muslims in Burma has not improved under democratically elected government”, said Kyaw Win of BHRN. In a continuation of their long-running tactics of incitement and discrimination against the Muslim community of Myanmar, the Ma Ba Tha began its organised opposition to the returns earlier this month when a family from the Wun Zin ward of the town encountered hostility from supporters of the group. A posting on the social media site Facebook by supporters of the Ma Ba Tha showed groups of people gathering on 1st October to prevent the family from returning home. The group also reportedly penned a letter to local authorities to forestall any official support for their efforts. Some of these accounts were corroborated in a Burmese-language report by the BBC, which emerged this week. 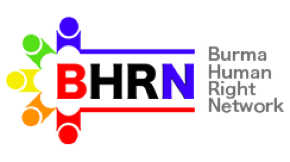 BHRN has heard that while the family reported the initial incident involving protesters to the authorities, little or no Police support was forthcoming and that rumours on social media about Muslims causing unrest prompted outright refusals to grant permission to the family to relocate. “[This family have been] away from [their] homes for 3 years and 7 months. They have requested to the authorities verbally and in writing to allow re-building their homes. When the local administrators went to meet them on 29 September they asked for permission, again as the situation has returned to normal, the local administrator did not say neither yes or no,” U San Win Shein, a local organizer of the National League for Democracy (NLD) told BHRN. Other Muslim families were also prevented from returning to their original homes as a result of Ma Ba Tha activities. Those affected included 70 families from Yan Myo Aung ward, 37 families from Wun Zin ward, 23 families from Kan Daw Min ward, and 30 families from Thiri Minglar ward. BHRN sources reported that that eight families (23 people) were forced by authorities to move from a sports ground in early September 2016, a site which has been used as a shelter since 2013. BHRN is concerned that the safety of these families could be at risk if the continue to be prevented from returning to their original homes. Anti-Muslim agitation by Ma Ba Tha is nothing new; having gone through a period of relative quiescence this year, the group began organising with renewed energy following the delivery of an Islamophobic speech in Meikhtilar Township by high-profile member U Wirathu in late August at an event held in commemoration of a governmental declaration, 55 years ago, that Buddhism was the official religion of Myanmar. Around 13,000 people, the vast majority from the Muslim community, were displaced following sectarian violence in late March 2013; three days of rioting and mob attacks were precipitated by an argument between a Buddhist and a Muslim in a gold shop. At least 40 were killed and dozens injured as a result of the ensuing violence; in one particularly gruesome incident, a group of Muslim children were set alight by mobs. Other grave acts of criminality, including the murder of a Buddhist monk by Muslims, took place during the unrest.